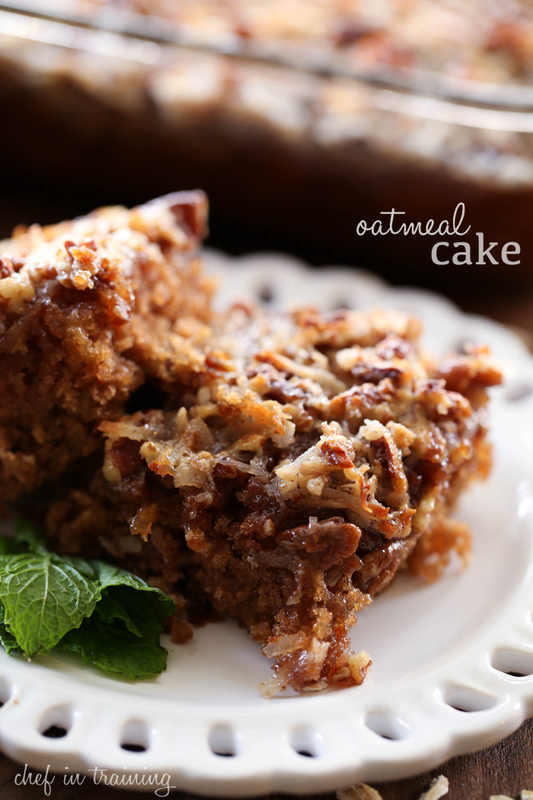 This Oatmeal Cake will be one of THE BEST things you ever make. Seriously I mean, okay, it looks pretty good, but how it looks doesn’t even compare with how it tastes! It is one of my personal favorite recipes here on the blog. It comes from that family cookbook my grandma made 20 something years ago and is truly one of the treasured ones in there. It is one of the most moist cakes you will ever experience. It literally melts in your mouth and the spices, textures and flavors fuse together to create perfection in each and every bite. You absolutely need to make this, you will not regret it! This cake is so moist and flavorful! It will quickly become a new favorite! In small sauce pan, bring water and butter to a boil. Once boil is reached pour into a large mixing bowl, add oats and let cool for 3 minutes. Beat in sugar and brown sugar and eggs until well mixed. Add flour, salt, baking soda, nutmeg and cinnamon and mix until well combined. Pour into prepared baking pan and bake for 30 minutes. Cream butter and sugar together in a medium mixing bowl. Add evaporated milk, vanilla coconut and nuts and mix until well combined. After cake has baked, spread topping very carefully over hot cake. Place under a broiler for about 2-3 minutes until golden brown. Watch constantly and carefully so as not to burn. This recipe is similar to my aunt's. The most amazing comfort food cake ever! Hers uses oil instead of butter, I am going to try it with the butter next time! Thank you for sharing this and those that haven't tried it, please do!!!! You won't regret it. Anything that you say comes from your grandma's handmade cookbook I know is a total keeper! I love that you have this book and share recipes from it! :) Pinned! i made this cake this week and it is so hard not to get a spoon and just keep eating. My hubby liked it too. What is sweetened coconut? Is it Macapuno? Or is it something that you make with the coconut to make it sweet? Thank you! I can't wait to make this. My family will love it! Now what idea do yoU Hve for me to use up the rest of the can of milk? I totally am hooked on your website. However, I am on a low sodium diet and I am wondering if your receipes have their nutritional info posted somewhere within? That would be so helpful, not for only myself, but others who might have diet restrictions. There is a website, I think it's nutritiondata dot com, where you can key in the recipe, and it will analyze it for you. Just input each ingredient and the amount (you will have to do some metric conversions, but there are websites for that, too), and it will calculate the sodium, cholesterol, carbs, etc. If you like the recipe you can save it to your personal recipes. It isn't perfect about finding odd ingredients like coconut sugar of agave sweetener, but you can add those to your own list of ingredients. I've been using it for about six months, since my mom went on a low sodium diet and my brother went on a pre-diabetic diet; it's been a big help. Additionally, you can purchase low sodium baking powder (if potassium is not a dietary issue), low sodium baking soda, unsalted butter, and many other substitutions so you can adapt them for your dietary needs. It usually doesn't change the taste much, if at all. The problem with these types of ingredients, as I'm sure you've found out, is they cost quite a bit more than regular ingredients. I have this recipe (or one very much like it) that was passed down in our family. We didn't us coconut and although I prefer pecans, my recipe calls for walnuts. This is seriously my all time favorite cake! Any time I have taken this to a work function or a potluck, people stand around the empty pan to get the recipe. Mine is also handed down, does not use coconut. The topping uses brown sugar instead of white and is brought to a boil on top the stove before being spread on the cake and then broiled. Probably my all time favorite cake! Can I use a bundt pan, when you boil your brown sugar are you using all the topping ingredients and then pouring it over? Would it be possible to adjust this recipe to use old fashioned oats? I have tons of those on hand, no one in my family likes the quick oats. This cake, oatmeal cake was under cooked following your instructions. Also didn't rises up like the photo you show. Do you live in a high alt. state? I live in Colorado (6500 above sea level). I adjust all my recipes, unless it states other wises. Hope that helps. This reminds me of my Grandma's but with a lot less butter. I might try this one. This is the best cake. MY mom used to make this cake when I was a kid and I am 57. Everyone always loves it, even if they don't like coconut, lol. My boyfriend's mother passed away when he was 26 years old. (he is 59 years old) He told me that she use to make this cake for him for his birthday every year. I plan on making it for him next month. I hope it tastes close to how is mom made it. Made this cake for my book club and it was a big hit! I think I am going to add some spiced, chopped apples and make it again - or maybe just use the instant oatmeal with apples!